The Gaye holud (pronounced guy hoolud) is an important pre wedding tradition at Bengali weddings. It is somewhat equivalent to a bridal shower. 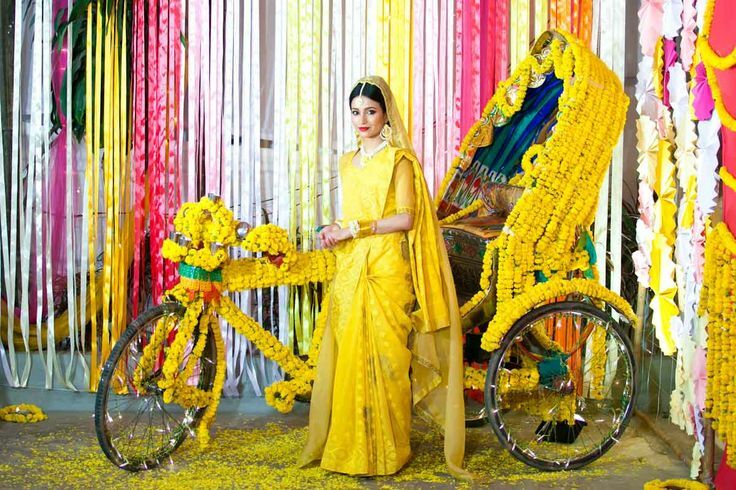 The term Gaye Holud translates roughly to body tumeric, It doesn't sound that great but it's one of the most enjoyable ceremonies. There are traditionally two holuds, one for the bride and one for the groom. The bride and groom only attend their own holuds but their families attend both. 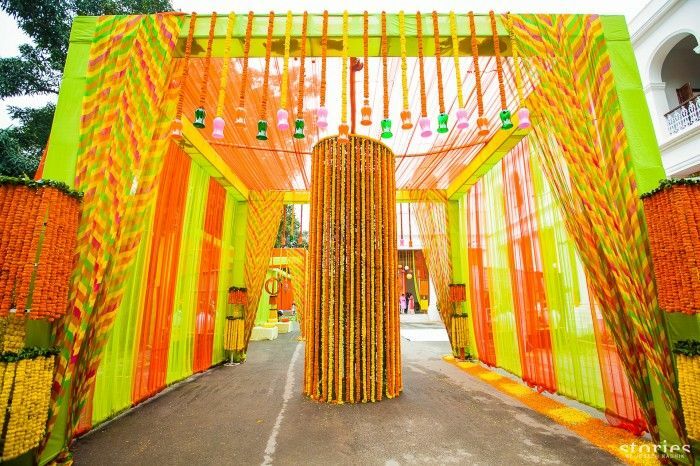 Decor tends to focus on bright colours, specially the colours, yellow, orange and green as well as fresh flowers. There are usually a wide variety of Bengal sweets, fruit displays, fruit carvings and finger food. The atmosphere is casual and fun. When the other family comes to the holud, the hosting family members line up and shower the guest family with flower petals, gifts and sweets. The guest family bring with them presents for the bride/groom whose holud they are attending. These gifts usually arrive in huge dalas or trays. They include gifts such as the brides/grooms wedding outfit, jewellery, cosmetics, sweets, and gifts for the brides family. Often fresh fish is also sent decorated like the bride and groom. Tumeric is an antiseptic with healing properties. It also leaves skin with a glow. For the holud ceremony, fresh tumeric is made into a paste with some water or milk and applied to the bride/grooms face, arms and feet. It is believed to beautify the couple for their wedding day. The bride/groom is then fed a Bengali sweet to add sweetness to their married life. Lastly some people also wear mehendhi/henna on this day. 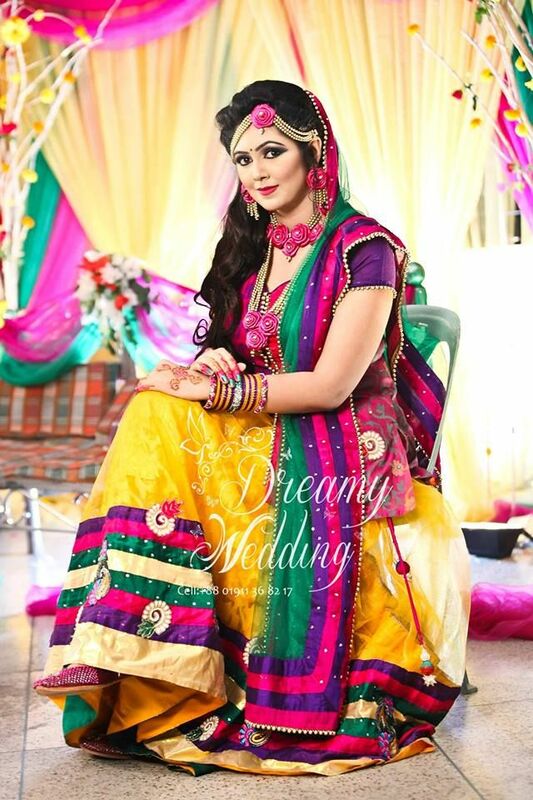 After the holud is applied the bride has a shower and changes into her second outfit ready for the mehendhi. 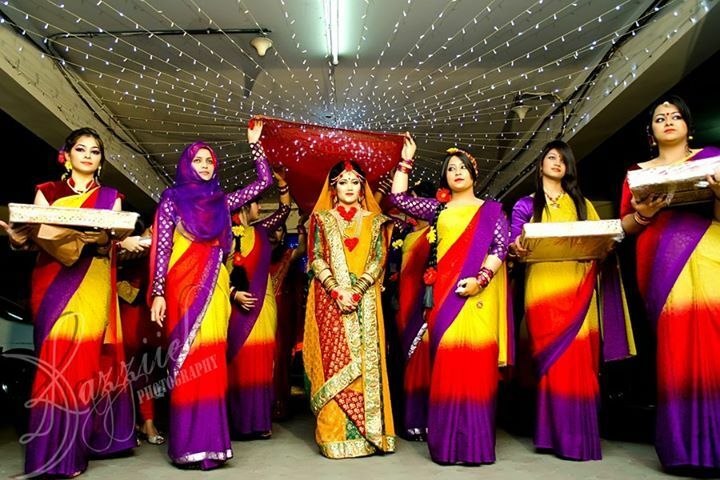 During the entire event, the family and friends of the couple perform skits and choreographed dance routines to entertain the bride and groom as well as the other guests.